The international community agrees on the urgent need to reduce greenhouse gas emissions from deforestation and forest degradation. With 13 million hectares of forest cleared every year, such efforts are critical to curbing climate change before it reaches a dangerous tipping point. But we are missing a vital opportunity to combat climate change—strengthening the land and resource rights of Indigenous Peoples and local communities whose well-being is tied to their forests. This publication analyzes the growing body of evidence linking community forest rights with healthier forests and lower carbon dioxide emissions from deforestation and forest degradation. 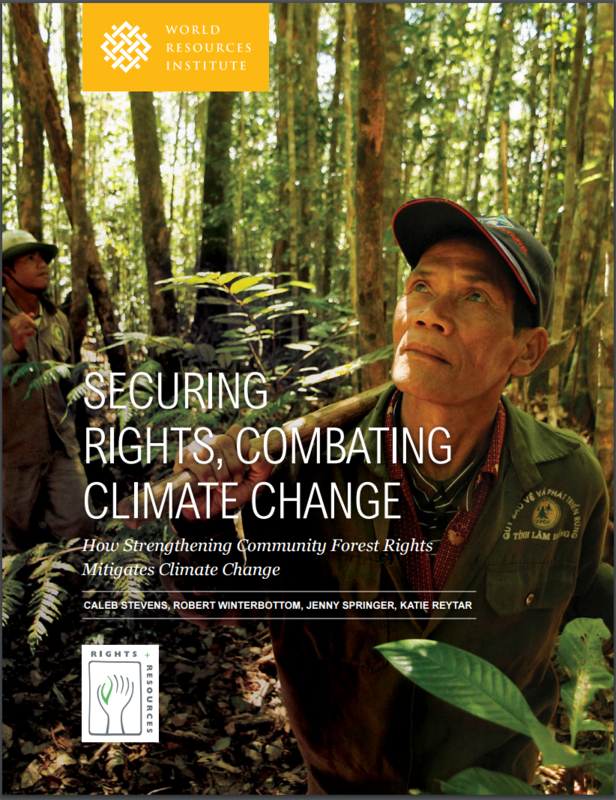 It presents a compelling case for expanding and strengthening community forest rights based on evidence drawn from comparative studies, advanced quantitative research, case studies, and original deforestation and carbon analyses by the World Resources Institute. The findings center on examples from 14 forest-rich countries in Latin America, Africa, and Asia. Together, these countries contain about 323 million hectares of government-recognized community forest—68 percent of the estimated total in all low- and middle-income countries—as well as large areas of community forests without legal or official recognition. Our analysis focuses on the links between legal community forest rights (or lack thereof), the extent of government protection of those rights, and forest outcomes. When Indigenous Peoples and local communities have no or weak legal rights, their forests tend to be vulnerable to deforestation and thus become the source of carbon dioxide emissions. Legal forest rights for communities and government protection of their rights tend to lower carbon dioxide emissions and deforestation. Indigenous Peoples and local communities with legal forest rights maintain or improve their forests’ carbon storage. Even when communities have legal rights to their forest, government actions that undermine those rights can lead to high carbon dioxide emissions and deforestation. Communities can partially overcome government actions that undermine their forest rights.